Here we go again with the F-word... No, I'm not going to start analyzing hip hop or gangsta rap songs here. Rather, it is the word that often elicits strong reactions from food lovers everywhere. Yes, I'm talking about fusion. 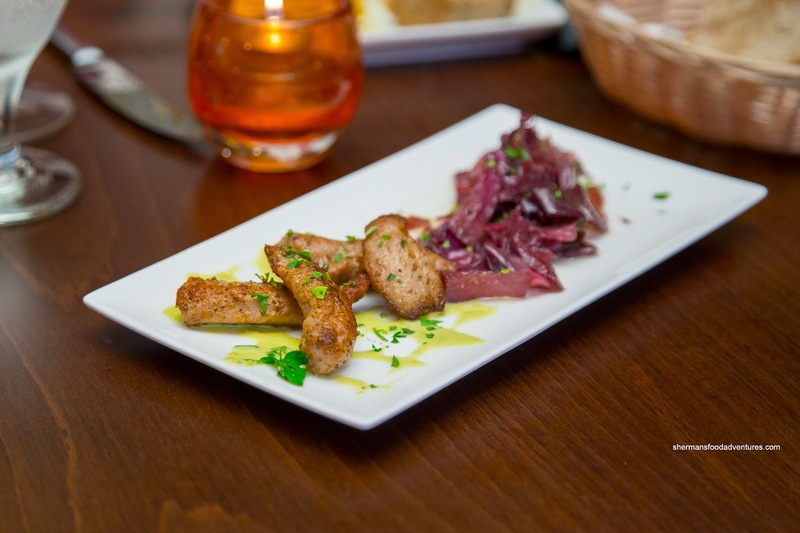 Generally misunderstood, fusion cuisine is often the blame for strange eats that is not easily categorized. But let me ask you this, if fusion is such a bad thing, where do you think Pho and Banh Mi originate from? So with an open mind and an empty stomach, Viv and I made our way to an invited tasting at Morocco West. 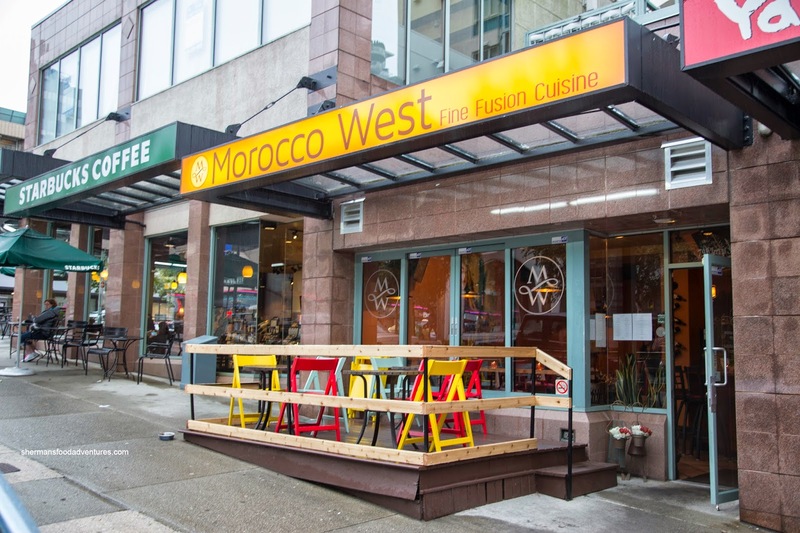 As the front signage suggests, the food at Morocco West is fusion rather than being straight-up Moroccan. With being said, our first appie was not really fusion as it was an actual Moroccan dish. 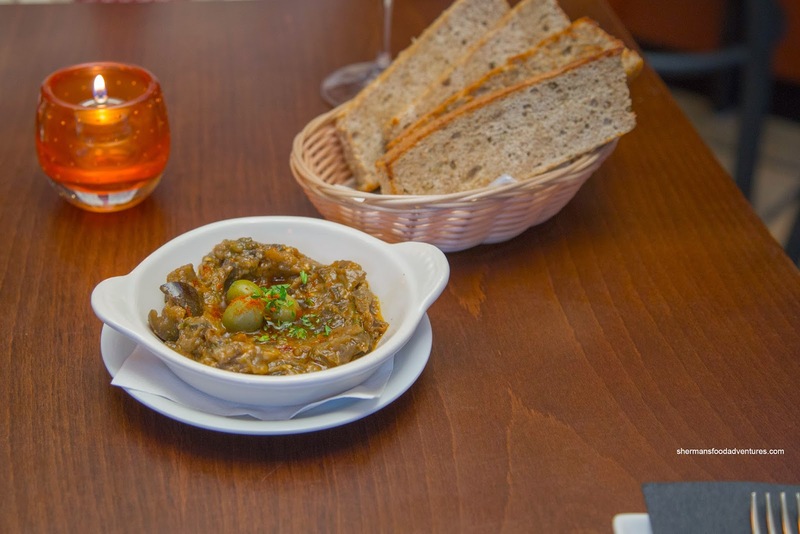 Zaalouk, made of spiced eggplant and topped with 3 olives, was served with house-made bread. Although the soft eggplant was quite mild, there was a low rumble of spice. The olives played a key role as they provided the necessary saltiness and zip to what otherwise would be an ordinary dish. We found the bread to be a bit dense, but it worked as a compliment to the eggplant. 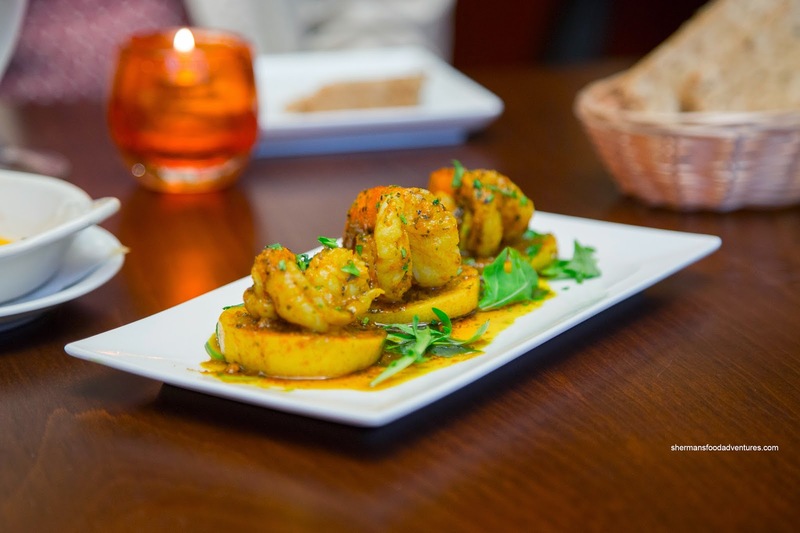 We thought the Chemoula Prawns was the best dish of the meal as it featured plenty of acidity. Consisting of barely cooked prawns exhibiting a meaty snap, the cilantro pesto butter already had enough lemon to brighten things up. On top of that, the cooked lemon slice allowed us to add even more zip (we happen to love lemon). 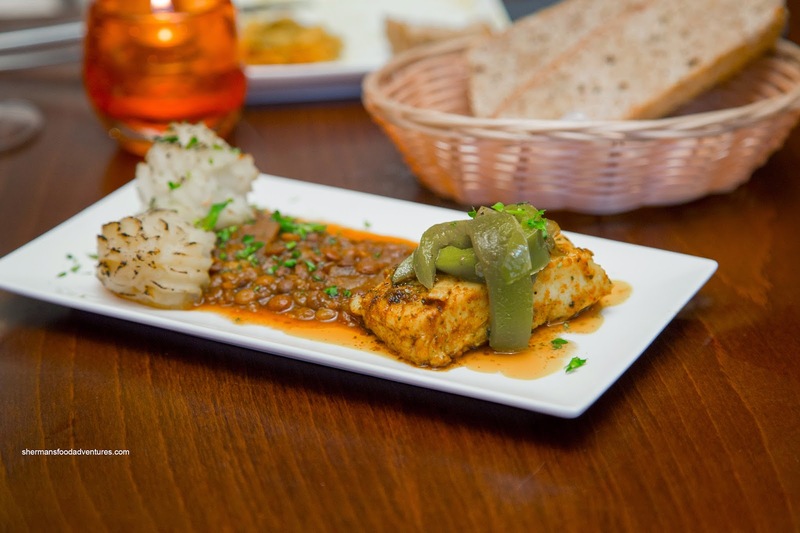 Next up, we sampled the Moroccan-Style Halibut with roasted peppers, lentil ragout and potato florets. Depending on what part of the fish, it was either a touch dry or completely moist and flaky. It appeared to be seasoned with similar spices as the prawns. I thought the lentil ragout to be well-balanced with a background spiciness. However, the lentils could've been more firm. Onto the Rabbit Tenderloin with braised cabbage medley and green pea velouté, it made me think of my daughter. She loves bunnies and I thought it would've been funny to send her a picture of the dish. But then again, that would've been mean and would've scarred her for life. I decided not to... As for the dish itself, the rabbit was somewhat chewy, yet it is a lean meat. We didn't like the seasoning though as it was far too salty where even the tangy cabbage couldn't help matters. The cabbage itself was a too greasy. 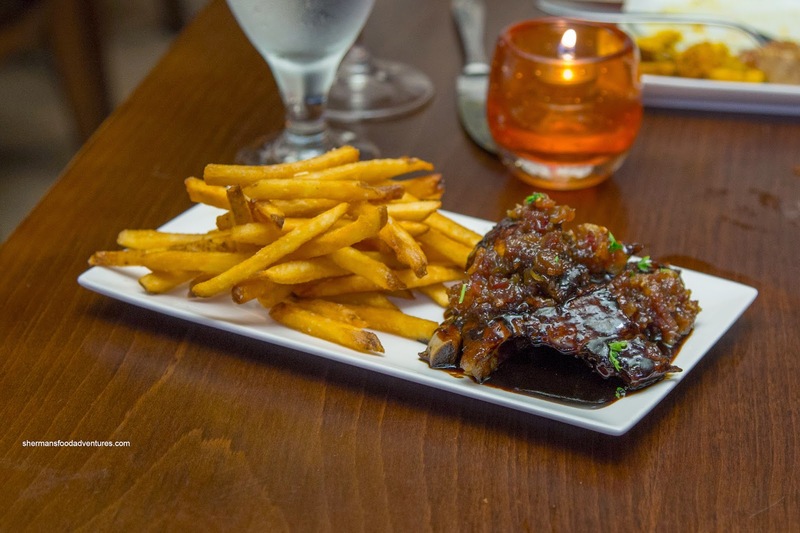 On the other hand, the Chef's Signature Baby Back Ribs were too sweet. Already tossed in a sugary balsamic reduction, the fall-off-the-bone and super tender ribs were in no need of more sweetness. However, the maple bourbon bacon jam added just that. There was actually a lot to like with the individual components, but they just didn't need to be with each other. Interestingly, Viv combined the bacon jam with the salty rabbit and it was pretty good. The 2 components balanced each other off. 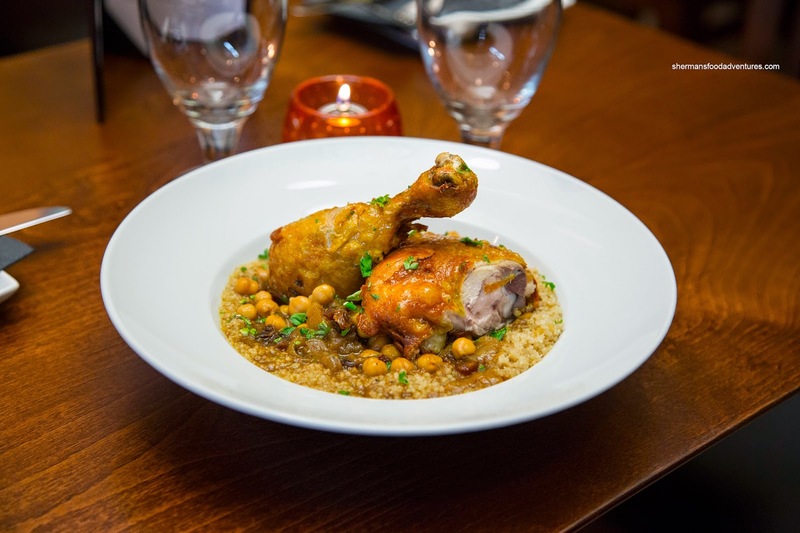 Out last savory dish was the Chicken Cous Cous with saffron chicken, chickpeas, onion confit, raisins and Moroccan jus. This was a substantial plate of food that featured a chicken leg with nicely rendered crispy skin. The meat was sufficiently moist, but lacking in seasoning (we didn't get much saffron). However, when combined with the rest of the ingredients, there was no issue as the raisins and onions added sweetness while the jus supplied the savory aspect. 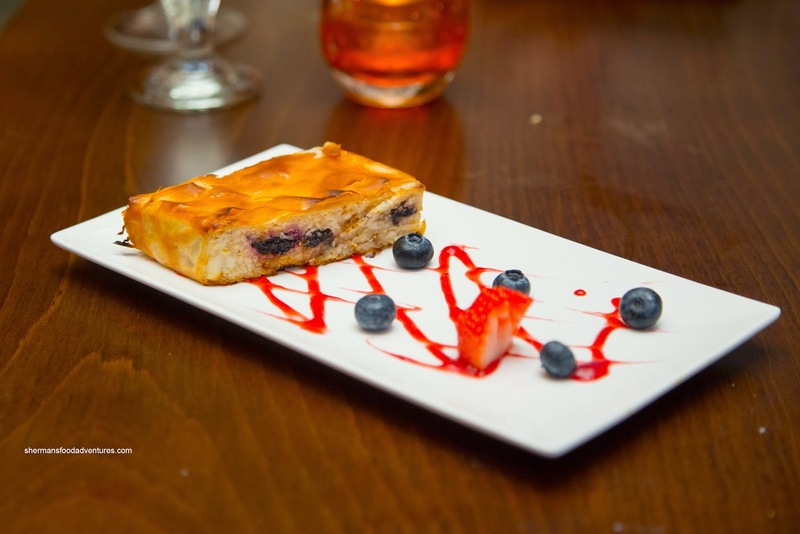 With dessert, we started with the Cherry and Ricotta Strudel consisting of Cointreau, fresh cherries and mixed berry coulis. I liked the crispy light phyllo exterior, but I found the filling to be too dense and somewhat dry. The cherries were nice though being purposefully sweet. Yet, there needed to be more of them as the strudel was very mild-tasting. 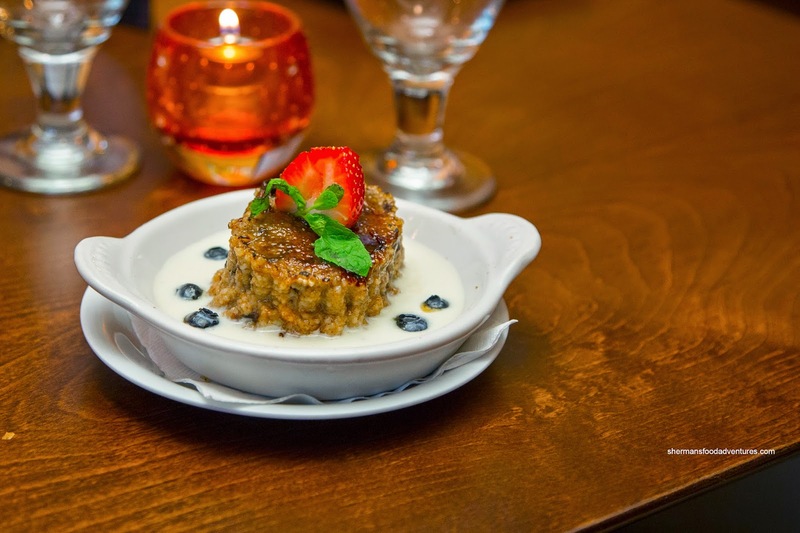 Something that caught our eye was the Cous Cous Creme Brulee with apricots, prunes, raisins, cinnamon and Crème Anglaise. I found that it resembled a cross between a rice and bread pudding. As much as it was mushy, I didn't mind the texture. With all the fruit, the whole thing was quite sweet, but somehow it worked for me. Ultimately, I give the chef kudos for attempting this and the other dishes. As you can see, some worked better than others. And really, that is what fusion is all about - experimentation with food. Some will hit the mark while others need to go back to the drawing board.